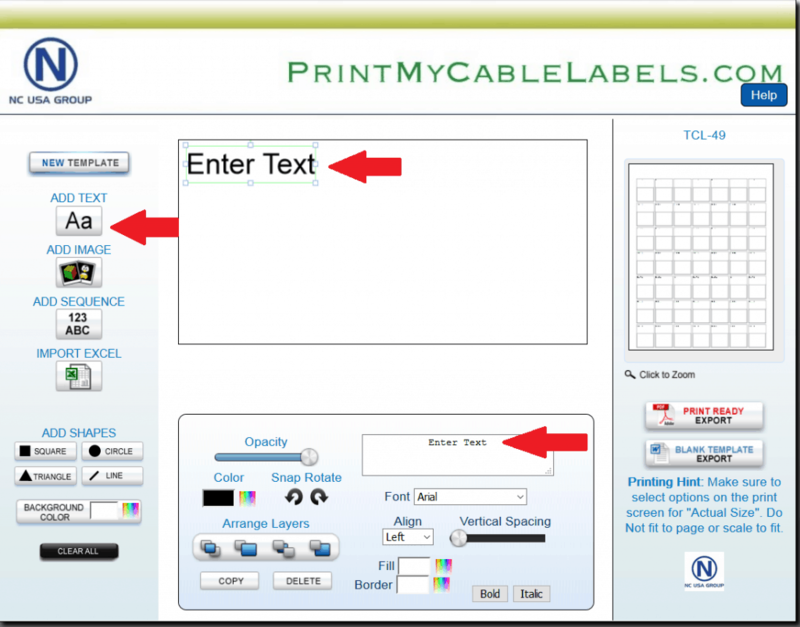 When you have selected your labels to click on the “ADD TEXT” button which will add a box to the print area. 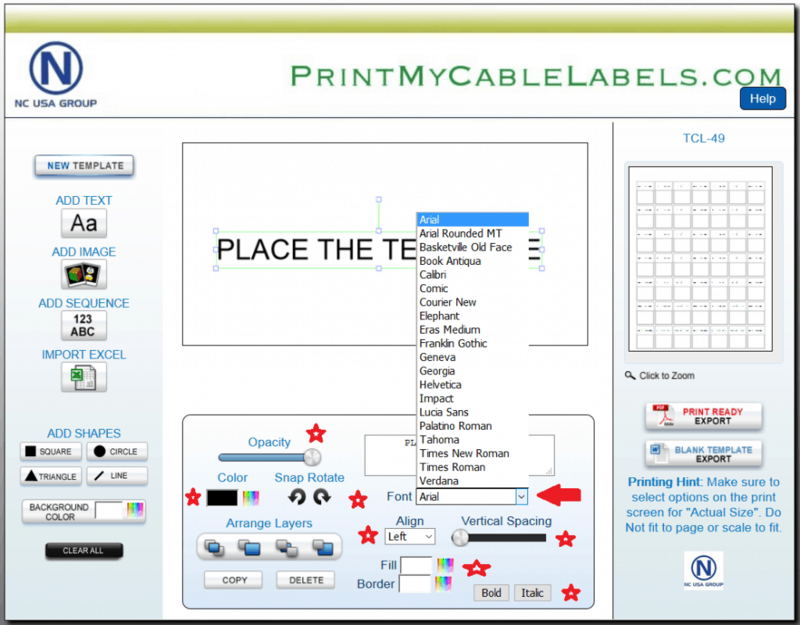 You may then change the text in the box in the bottom text section, you may add numbers or text for your cable labels and they will be ready for you to position the text on the label area. Once you have the text you want in the bottom box, which can be one, two or more lines. you can then drag the text to size using the corners. Just hold the mouse over the part you would like to drag, click and drag to the size you need. Remember that text cannot fill to the edges, as all printers are a little bit different some space should be around the text. You will be also able to change the type of font used in the drop-down list. The text area at the bottom has many functions. Opacity, this can be used to make the text lighter or more see-through, if you wanted to show a watermark. Color can be changed when using a color laser printer. Snap Rotate, this will enable you to move the text sideways or 45 degrees, or even upside down. Align, standard left, right, center and Justify which make the text area better to manage. Vertical Spacing, allows you to set the top to bottom spacing in a very easy way. Fill, will color the text area you are working on to any color. Bold and Italic will change the text with one click. The Copy button will copy the whole text section, for multi-lines of the same. 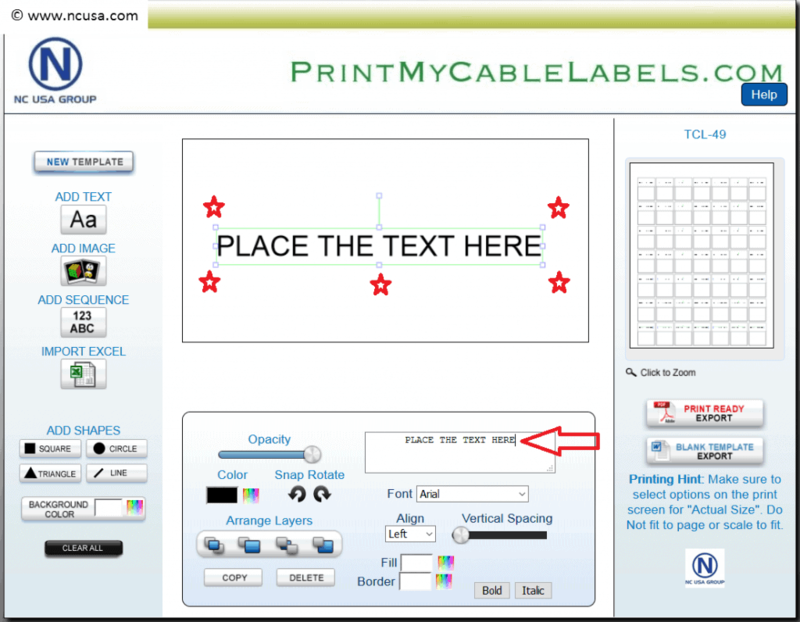 If needed you can also import text from excel if you needed, this can be mixed and matched on each cable label with fixed text, excel imports and background colors as needed.